Our Life Enrichment Directors, who manage all activities and outings for our residents, are a fountain of information. They have a repertoire of musical selections, jokes on hand, trivia to share, and a wealth of knowledge about the lives of each of our residents. It is no less than impressive. But now, with the help of Alexa in our communities, they are unstoppable. 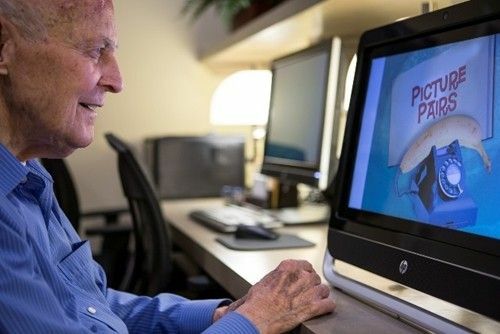 Aegis Living has placed Echo devices in each of our assisted living and memory care communities. These are used throughout the day during Life Enrichment programming particularly, as well as by staff and residents. The myriad of facts, figures, information, names, current events, and music are never further away than your voice—“Alexa!” Life Enrichment Directors know that to keep the rapt attention of this older generation, some with cognitive impairment, can be fleeting. No one wants to watch an opportunity go by, especially when you can engage with a resident, remind them of a fond memory, or bring a little joy to their day. For those of you who may not know, Alexa is the software behind the Amazon devices such as Echo. The Echo itself is a speaker with a built-in microphone. If you call out “Alexa,” the device is ready to answer, in real time, a question or command that follows. It does not rely on voice recognition, so anyone is able to use it. The goal of our Life Enrichment Program is to nurture the mind, body, and spirit of our residents. We find that Alexa is a great tool to support our staff in their efforts to do so. The immediacy of information is what makes the difference in our activities. There are no gaps. We can quickly build on an idea or find out more information to keep the conversation going within seconds. Music is also an integral part of our Life Enrichment program. Music is a valuable part of our lives, no matter our age. Music has been known to open a pathway to a person’s life and unlock memories. Having access to music on demand with Alexa can instantly bring a room to life. Whether it’s Big Band, Swing, Cole Porter, George Gershwin or Pachelbel Canon in D, there is an amazing connection that sparks long term memories of amazing moments and events in their lives. Alexa is an excellent resource for seniors needing assisted living and memory care. We find that many assisted living seniors like to use Alexa for current events, while it makes a great tool to reminisce for our memory care residents. And we have found it particularly beneficial for those with visual impairments, who don’t need to read to use the device. Alexa is quick to tell a joke, play 20 questions, report the weather, guide a class through meditation, or produce facts about the day, like famous birthdays, on this day in history, or #1 song on the charts in a particular year. The technology itself is only a few years old. New features are being added and automatically updated every week, so we are learning new and exciting ways to use this tool within each community. The future of how Alexa will be used within our assisted living communities is continuously evolving and growing. Aegis Living is so pleased with the technology that they will be adding an additional device to each community in Washington, California, and Nevada. The ultimate goal is to have an Alexa-enabled device in every apartment. For a generation that did not grow up using as much technology as current generations, this voice app makes it easy for them to engage with technology. Senior residents have adapted to using it very quickly. Alexa has seamlessly integrated into our programs throughout the day. Residents are amazed at the endless amount of information that Alexa can share. They try, but they can’t often stump her for facts and trivia. One of our residents likes to ask about the score of the upcoming baseball game. And more often, than not, Alexa seems to get close or guess the score correctly. Alexa has been a useful asset to our assisted living and memory care communities, but it can also help the caregiver at home. Alexa can be programmed to remind a caregiver to give their parent medication at a certain time each day. The device can answer simple questions about what time it is or the weather in a pleasant manner for those seniors who are forgetful. And if you care for a loved one with dementia who is repetitive, Alexa will happily answer a question over and over again with the same correct answer which can give a caregiver a break. It is also helpful for the elderly with mobility issues because it will obey commands such as turning off a light in a room or adjusting the temperature on the thermostat with only the sound of their voice. It is an intelligent companion for many caregivers at home who need more support. If your mom or dad can no longer live on their own, contact an Aegis Living communitynear to you to take a tour. We are happy to show you everything we have to offer your parent. And you can see Alexa in action for yourself!